"A murderously funny thriller… Imagine David Lynch’s bizarre masterpiece Blue Velvet, scripted by Edna Buchanan and Carl Hiaasen. It’s a blast." "This is great fun, and if Liss is trespassing on Carl Hiaasen’s turf, well, who cares? It’s a big state." "Readers will enjoy this wild and highly entertaining ride." "The jump from financial chicanery in seventeenth-century London to redneck craziness, South Florida style, seems daunting, but Liss sails across the abyss unscathed. . . Hiaasen’s homeboys will feel right at home down in the muck with a gang of evildoing pig farmers." "Gripping entertainment from the opening pages-a terrific read with the page-turning energy of a first-rate thriller, but also far, more than that. 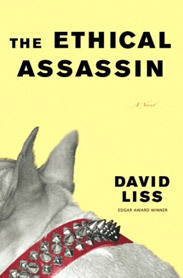 David Liss has written a genre-bender with more than its share of white-knuckle suspense, vivid characters, and surprising humor." "Hilarious, poignant, and laced with paranoia, The Ethical Assassin reads like a Hardy Boys mystery on acid. David Liss pulls out all the stops in this Homeric coming-of-age tale. A vibrant and sweaty page-turner, this book explodes with fresh, memorable characters and a soundtrack I’d like to own."